The Plaza Hotel, impressive due to its magnificent façade, glories in its colonial architecture. Inside you will find exotic birds, fountains and beautiful stained glass windows. 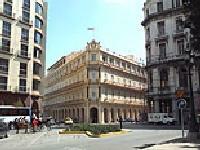 It's location on the Parque Central make it an ideal base for exploring Havana's magic.